Pelican 2390-000-110, 2390-000-130 2390 M6 3W High Output Tactical LED Flashlight FREE SHIPPING! This 3W Luxeon light was cutting edge great technology a few years ago. It is still a tremendous 2-cell CR134A light that is built like a tank. It is housed in a fairly large aluminum body, so it is not as compact as some competitors you can now find today. But it has almost no heat build up, and it is bomb-proof rugged. I bought 2390 this with total confidence after buying a Pelican 8060 which is hands-down a fantastic rechargeable duty flashlight with the famous Pelican Warranty. I carry a 185 ElZetta ZFL-M60 (w flood emitter) 2-cell on my duty belt that also can be dropped into my patrol shotgun light mount. This Pelican 2390 light was bought to keep permanently on my work shotgun. It was a great decision. The beamshot is a very hot and neutral white hot spot with a lot of throw compared to the ElZetta's Malkoff flood emitter. And this Pelican 2390 still has a LOT of spillflood in spite of having a very tight hot spotthrow beam. 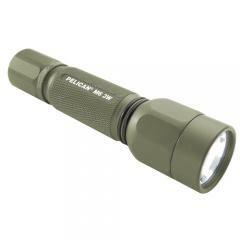 The Pelican 2390 tailcap switch can easily be used as an intermittent. But when I turn it ON there is no "click" feel or audible feedback. Compared to all my other lights the absence of audible and tactile feedback is a bit disconcerting at first but I can work around it. It comes with a really crappy nylon holster which houses two spare batteries (nice idea) that would be almost great if the belt loop snap would not come undone by just looking at it. The belt loop should have been sewn, not feature a snap that is awful. Pelican sent me a replacement holster that has the exact same problem. It is unusable because merely sitting down causes the snap to come undone. It's a Pelican light, for God's sake. Lifetime "No Questions" Warranty. Professional Quality. Made and serviced in America by Americans. The LED is not a CREE but it's a damn fine light and it runs cool while being plenty bright. ©2002-2019 CopsPlus.com: Pelican 2390-000-110, 2390-000-130 2390 M6 3W High Output Tactical LED Flashlight FREE SHIPPING!